Research consistently finds that men are less likely than women to reach out for support for their mental health, or even recognise it as a problem. In June 2016, The Men’s Health Forum created ‘Beat Stress Online’ to offer an anonymous and confidential chat support and signposting service for men experiencing difficulties with mental health such as stress, anger and depression. The McPin Foundation were commissioned to evaluate the service, which ran until early 2017. Fifty anonymous conversations between men and chat volunteers were analysed by McPin, in order to examine changes in sentiment towards seeking help offline. We looked at how men initially presented their mental health difficulties and the language they used to do so, what staff did to encourage changes in attitudes towards using services, and how chats resolved. The chat transcripts provided some fascinating insights into the benefits of a confidential and anonymous service like this for men. It seemed to facilitate an opportunity for men to ‘dip their toes’ into help-seeking behaviour for their mental health for the very first time, as the services anonymity meant it was ‘risk free’ compared to talking to people they knew. For those men who’d never reached out for support before, it was often clear they lacked knowledge about mental health and weren’t sure what their problem was, or if it was serious enough to go to a doctor for. Chat volunteers helped acknowledge the issue for these men and signposted to information or services, as well as letting them know that they wouldn’t be wasting a doctor’s time. Other men had reached out for help before but used the service to open up confidentiality about their concerns and doubts, as well as seek advice about self-help strategies. A common theme in many of the chats was that men wanted to be able to fix the problem themselves rather than seek help from others. Some men seemed to be using the service just to talk or vent privately about problems in their personal life, and benefited from the opportunity to be honest without this having an impact on people around them. What was really interesting to me in conducting the analysis was how the opportunity to interact with someone benefited men. A lot of the information provided by the volunteers is already available online. However, the additional opportunity to ask questions such as ‘What is therapy like?’ ‘What will happen if I go to my GP?’ ‘Is it serious enough?’ and even ‘What’s wrong with me?’ or ‘Is it normal?’ seemed invaluable in helping to remove some doubts and barriers to seeking help offline that men had. It wasn’t always easy to tell how chats resolved because sometimes they disconnected, or men didn’t mention what they planned to do following the chat, but we did find evidence that some men had changed their attitude to seeking help offline. Some said they were planning to go and see a doctor after having chatted with a volunteer, others said they felt better already, just by having got things off their chest. Many men benefited from having someone acknowledge their issue and how difficult it must have been for them, with some having struggled alone for years. In an ideal world men would all be more open about mental health issues and ask for support at an early stage. 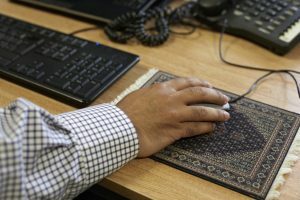 Confidential and anonymous online services like Beat Stress Online currently remain vital to helping men to start accessing the support they need. The full report detailing The McPin Foundation’s analysis can read here.